AM Radio Antenna – Boost your AM Radio’s signal instantly! No other single device can improve your Portable AM Radio’s reception, than this tuned loop AN100 AM Radio Antenna. This AM Antenna seems to almost magically boost the reception of your AM Radio’s signal. Night and Day performance increases can be achieved, reducing static, increasing signal strength, and tuning in stations that are barely receivable to a comfortable listening level. RadioLabs has the most powerful AM Radio Antenna on the market. The amazing AN100 open-air tuned coil AM Radio antenna, works by tuning a large open air loop of wire with a capacitor, to a very specific frequency and radically boost the reception of your AM Radio, beyond any limit capable by an AM Radio by itself. 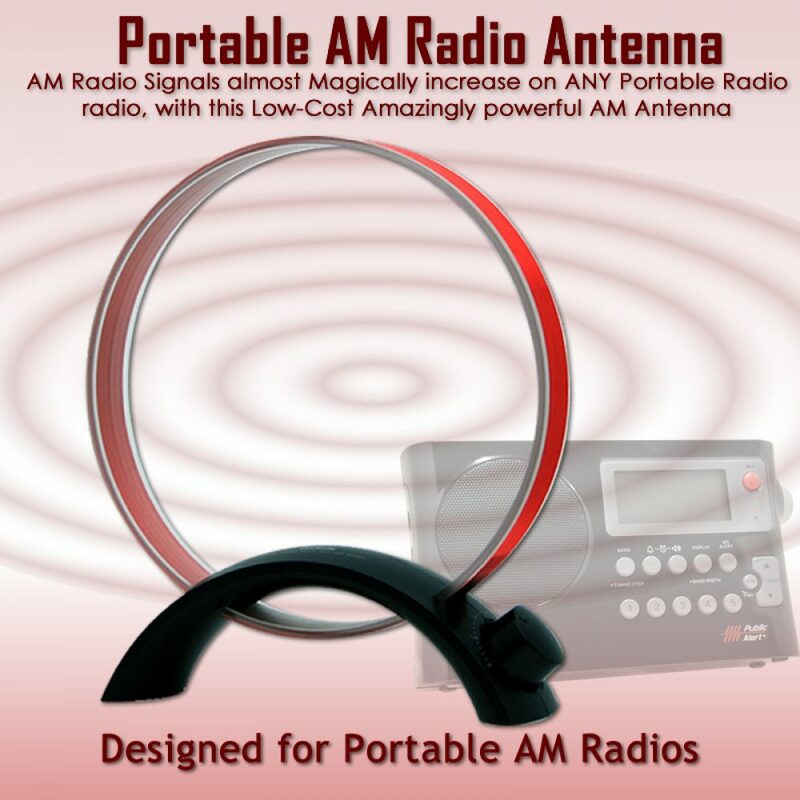 This tuned coil AM Antenna not only boosts the signal to levels you never thought possible, it is also directional and allows you to tune the AM radio station, plus direct the angle of reception to pick up a specific station, as well as reduce or “Null” out noises created off to the sides. This directional antenna, is so remarkable, that most people who’ve never seen these type of antennas work, think that some amazing voodoo has taken place. 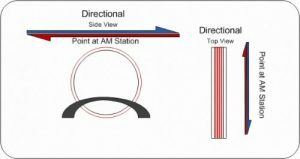 How it Works: Placing the AN100 AM Antenna behind your portable radio or any radio with an internal Ferrite Rod Antenna, then slowly tuning the knob allows you to drastically improve the AM Radio Station! No Wires, no cables, no batteries are required. A Huge, dramatic increase in signal is achieved, almost like you moved instantly closer to the station. Static decreases, signal increases, noise, pops and surrounding interference is decreased in an instant. Note: If your AM Radio is a table top, or a home stereo receiver, or does not have a Ferrite Rod internal AM Radio Antenna, you will want the AN200 AM Radio Antenna, with External Antenna jack and hardwire. Portable AM Radios have what’s called a “Ferrite Rod” antenna inside of them. This antenna is used for AM and “LW” reception only. (LW is mostly used in Europe). This low frequency antenna has excellent characteristics at tuning low frequency signals. The AN100 Loop Antenna works by becoming “Resonant” at a specific frequency and once tuned, any station on this resonant frequency increases in strength. 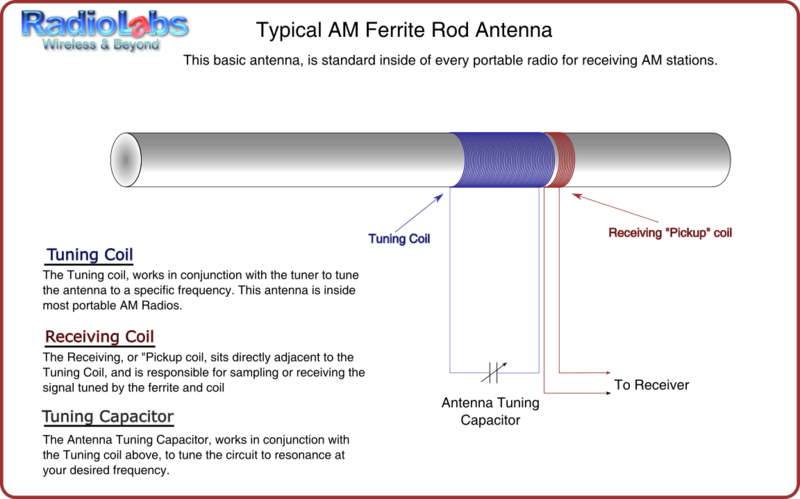 The antenna then resonates all frequencies and a ‘field’ is produced around the antenna. Any device within this small radiated field will also resonate. If your AM portable radio’s antenna is within this ‘field’, it will receive a huge boost in performance and all AM Radio Stations transmitting at this same frequency will be improved dramatically. Simple, one knob tuning, is all that is required to adjust the antenna for your AM radio station’s frequency. This tuned air-coil “Loop” creates an almost magical effect that can only be described when you see it. Stations which are barely received, down in the noise floor, instantly pop out of the static and you can listen to them quite easily. This allows you to rapidly tune and listen to your station in comfort. This antenna, simply sits behind your portable radio within a couple inches. 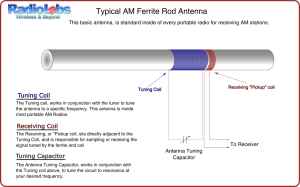 Your radio’s internal ferrite rod antenna responsible for AM reception will see a HUGE boost in power and amplified receiver signal strength. Once you use this antenna a couple of times and get a feel for how it works, instant tuning and adjustment of the AN100. If you are an AM radio fan and have listened to AM radio for a while, you will likely notice that the signal varies a lot. Certain times of day, static and interference become a problem. With Plasma TVs, switching adapters, computers, fluorescent lights and a host of interference problems, it’s amazing we can listen to AM radio at all. Most people think they need a stronger AM radio. The problem with this, is that a stronger radio, only means stronger interference. Only certain radios, which have been designed with tighter filters and noise reduction actually work to improve or boost the signal without noise. RadioLabs 909x ClearMod is an example of a radio which has been specifically designed to filter the noise to the side of the main signal you are trying to tune. Our 909x, coupled with the AN100 antenna, work in tandem to produce the best possible signal you can receive out of any portable radio. The next big jump, requires a MUCH larger antenna, a very specifically tuned circuit and a professional level receiver capable of receiving signals far below the traditional noise level found on consumer based low cost receivers. Our customers have had tremendous success receiving stations from hundreds, or thousands of miles away during the night time, receiving AM radio stations all across the United States, far down into South America, across the Atlantic into European countries on Long Wave (LW) , and even into Asia, listening to the 909x and AN100 AM Radio Antenna and pointing it across the Pacific Ocean. We have received dozens of emails, phone calls and online chat from customers who are simply amazed at the performance of our 909x and the AN100 antenna who have received signals from places they thought impossible.